It's easy to complement the style trends in your boutique shop or specialty store with the fashion forward damask carved hangers, exclusively from Store Supply Warehouse! These color infused plastic hangers measure 14" and are perfect for jeans, skirts, and strapless dresses or tops. The classic black color is melted into the natural mold of the hanger. This keeps the color from rubbing off the clothes in your store! 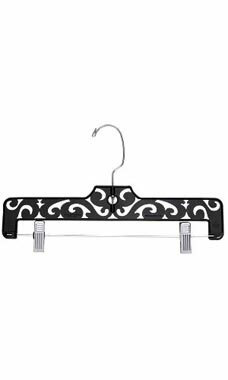 All of our carved black boutique hangers are sold in cases of 50 at discount prices!